When you come to our offices, you may notice a bit of dog hair here and there. Important members of our staff tend to shed. There be collies here. It’s all Kelly’s fault. 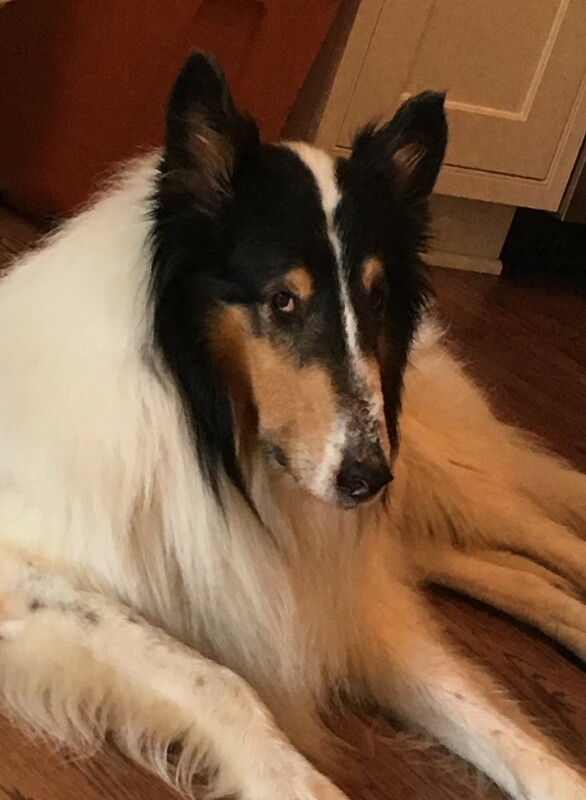 When Kelly started to work for what was then Law Offices of Benjamin F. Farah, she had a tri-colored collie by the name of Conrad. He was a big old fellow – very gentle and very quiet. And a bit neurotic as the breed tends to be. Conrad visited the office only a few times. Unfortunately, he succumbed to an infection he never should have gotten. With a void in her life after Conrad’s passing, a sable and white puppy named Beatrice Bell joined Kelly’s family. Bea was a bit of a handful as puppies tend to be. But she has settled out a bit as she has gotten older. Bea is extremely vocal. One expects dogs to bark, and Bea is no exception. But there is more than barking. Bea makes all sorts of interesting guttural sounds and sighs. Bea is a part time member of the firm, usually working only on Saturday mornings, though occasionally will work other days of the week. Ben was not a dog person. Growing up he had a couple of cats, but that was it for pets. He was acquainted with a neighbor’s husky but that was about it. Then Kelly started bringing Bea to the office. Over the course of several months, Bea stole his heart and he even stopped washing his hands after each time he touched her. Bea became his baby. And soon he wanted his own. 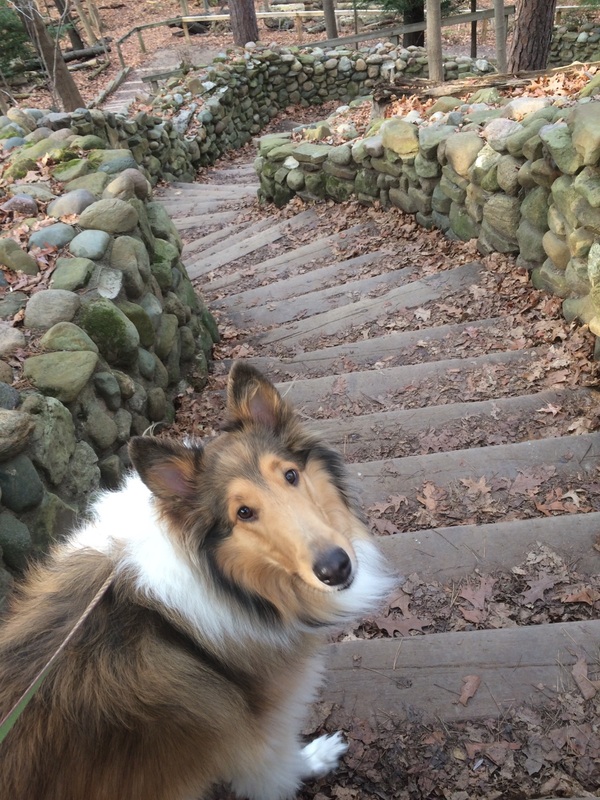 In March of 2015, he and his wife, Ann, adopted Jennifer D. from the Northeast Ohio Collie Rescue. Jennifer was a tri-colored collie, and was rescued from somewhere in East Cleveland. She was somewhere between 7 & 9 when she was adopted and had been de-barked at some point in her life. Debarking is the process of shaving down the vocal chords. It does not take a dog’s voice away but reduces the volume. When Jennifer barked, it sounded like she had a 5 pack of cigarettes a day habit – it was soft and husky bark. 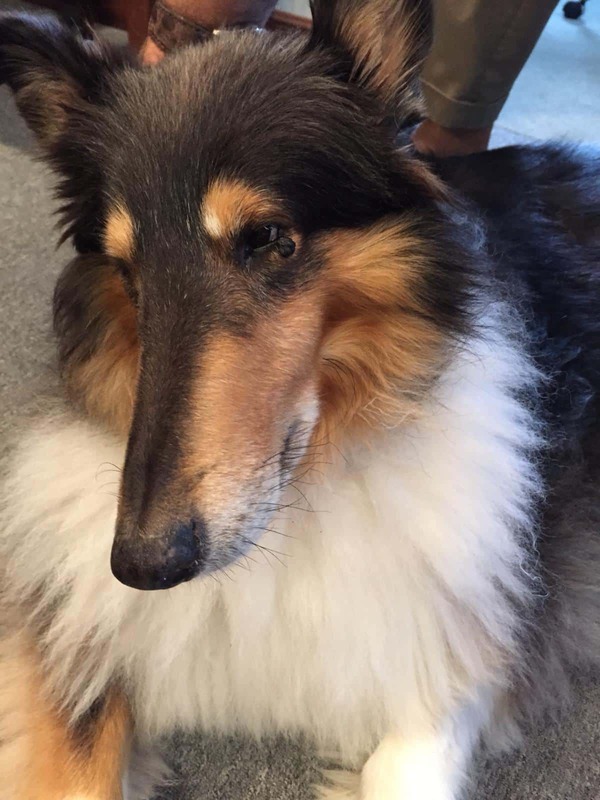 Being very chill and quiet, Jennifer became the first full time collie member of the firm. She would usually be found lying by the front door of the building. She was an excellent watch dog. From her vantage point, she would watch people come in the building, and maybe acknowledge them by raising her head. Alas, her tenure with the firm was short. She succumbed to congestive heart failure on June 11, 2018. Now Ben and Ann had a void in their life. But to the rescue came Almost Home Collie Rescue. In July, they adopted Grace Philomena, a 4 year old sable & white. Gracie P. is a very shy girl, and having been penned outside in Tennessee for her entire life, is afraid to be outside. While she is capable of barking, she doesn’t – as of this writing she has given a single bark 8 times. She is a work in progress and perhaps one day will become the watch dog that Jennifer was. Succumbing to peer pressure, Stacey is now with a collie. Stacey has adopted Sy from Almost Home. 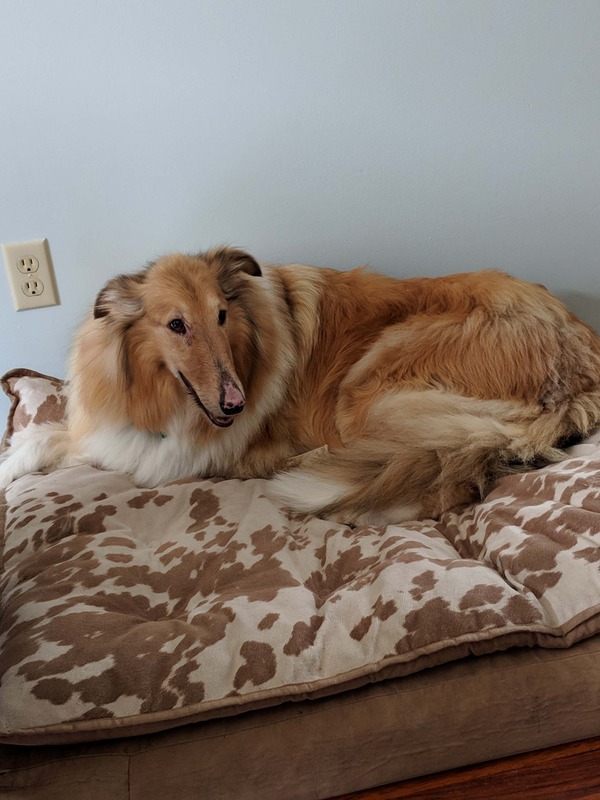 Sy is a white collie with a tri-colored head. He’s a big boy, about 8 years old. He too is friendly, doesn’t bark, and very chill. Unfortunately, when he was surrendered to Almost Home, he had never been to a vet and is positive for heartworm. Until his treatment is concluded, he needs to be kept quiet. Accordingly, he has not been coming into the office, but we expect him to regularly attend work in the future.